Posted by Tom Crimmins Realty, Ltd. on Friday, January 25th, 2019 at 9:54am. THIS HOUSE FOR SALE CAN BE FOUND ON OUR WEBSITE TOMCRIMMINSREALTY.COM AS WELL AS NYC.FLEXMLS.COM (MULTIPLE LISTING SERVICE).Welcome Home to 56 Parkview Loop, centered and close to all transportation, near highways to take you nearly anywhere.. It's very close to shopping & the mall is only minutes away! Staten Island College & Parks are right around the block! This young home is well-kept and maintained for the next perfect buyer! Property's association maintains outside all year round! MAIN FLOOR offers a large Living-room, formal Dining room, Kitchen with updated appliances, granite, back splash & much more.. updated Half bathroom. 3RD FLOOR, offers large bedrooms, full shared bathroom, Master bedroom with walk-in closet & plenty of attic space. GROUND FLOOR offers additional space for family room, with access to garage & utilities room, with closets all throughout. IF YOU ARE LOOKING FOR MORE HOMES IN STATEN ISLAND PLEASE CLICK HERE TO BE DIRECTED TO OUR WEBSITE TO VIEW MORE OF OUR MLS LISTINGS AND/OR CONTACT US AT 718-370-3200 DURING OFFICE HOURS. 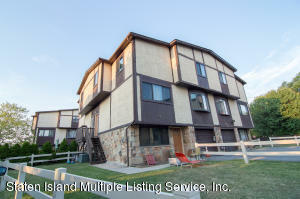 WE OFFER A LARGE SELECTION OF CONDOS, TOWNHOMES, SINGLE FAMILY HOMES, 2 FAMILY HOMES, AND LUXURY HOMES. OUR TOP OF THE LINE REAL ESTATE AGENTS IN STATEN ISLAND'S BEST REAL ESTATE REALTY WOULD BE MORE THAN EAGER TO ASSIST YOU! WE CAN HELP YOU EVERY STEP OF THE WAY- FINDING AN AGENT, HOME SEARCHING, SELLING HOMES, STAGING A HOME, NEGOTIATION, HOME INSPECTION, MORTGAGE PROCESS, WALK-THROUGH, AND CLOSING. WE ARE PROUD TO SAY WE ARE THE BEST REALTOR IN STATEN ISLAND.